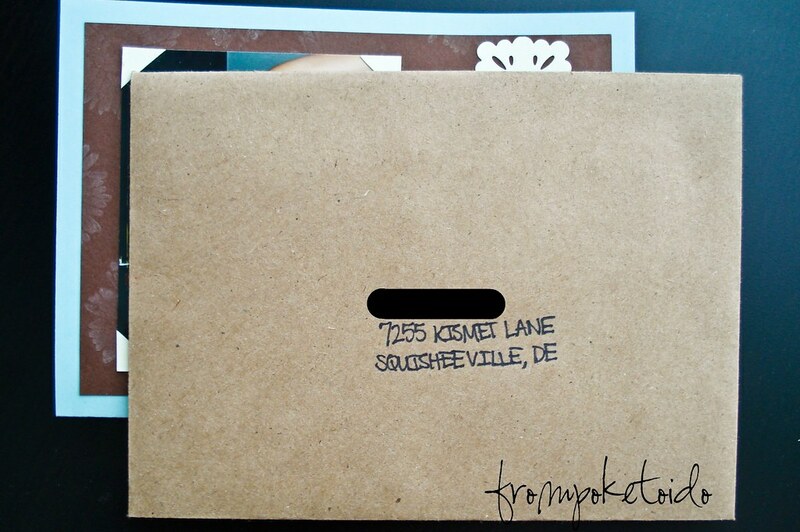 I immediately envisioned my fabulous vintage number (I'll be blogging more about this later), and my heart skipped a beat. I have been trying to brain storm ideas on making my vintage dress more modern, and this is the perfect inspiration. 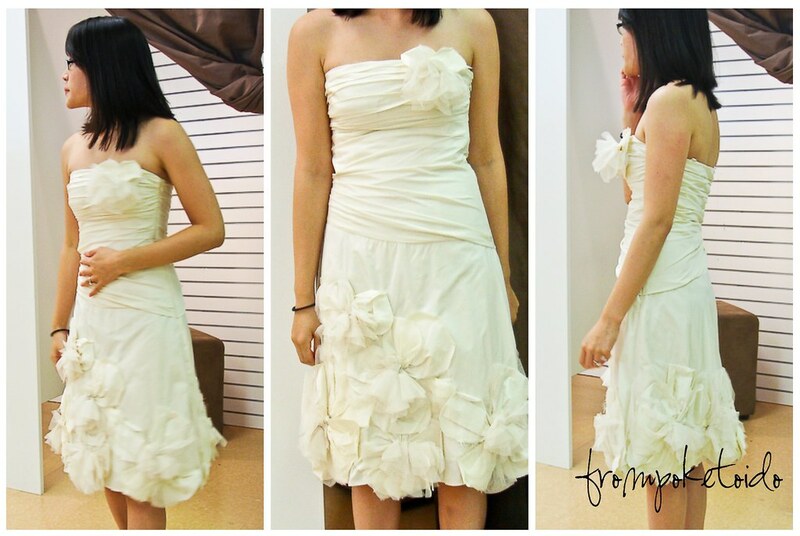 The lace, neckline, and flutter detail perfectly match mine. I am itching to show this to my future seamstress and let her work her magic using this great inspiration from one of my favorite designers. Swoooon!! Okay so Monique makes her design look gorgeous and totally fabulous, and my dress just looks old and vintage. It's okay because I paid $25 for mine, and Monique is worth thousands of dollars (way beyond my budget) more. I think my beauty has potential. What do you think? 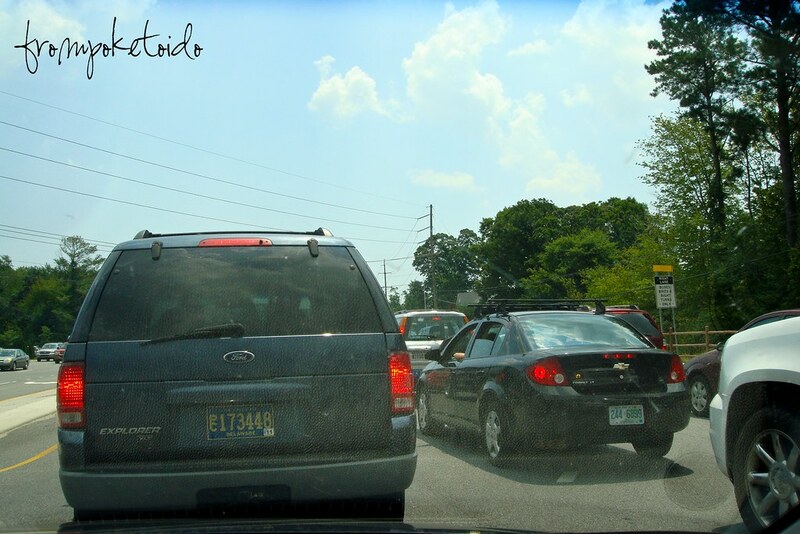 We left off in traffic, and can you guess what happened next? Yes, we were stuck in more traffic. While this is perfectly normal for a weekend trip to the beach, we didn't want to stick with the norm. We wanted to take a break from being around other cars and stretch our legs a bit. Solution? Shopping!! Outlet shopping! The Tanger Outlets are conveniently located by Rehoboth Beach, and they have a great selection of stores. Last year we decided to make it tradition to stop by the outlets before getting to our final destination. For us it's a great way to take a break and hopefully return to lighter traffic. Bathroom, anyone? It's also the perfect rest stop for a bathroom break. Hubby took this picture just as a guy was walking in to go to the loo. For such a well traveled area, I expected the restrooms to be dirty, and I was pleasantly surprised to find them updated and very clean. We enjoyed playing around with odd merchandise. I guess that's why they end up in the outlets since no one really spends full price on them. You might remember my earlier post about this dress. 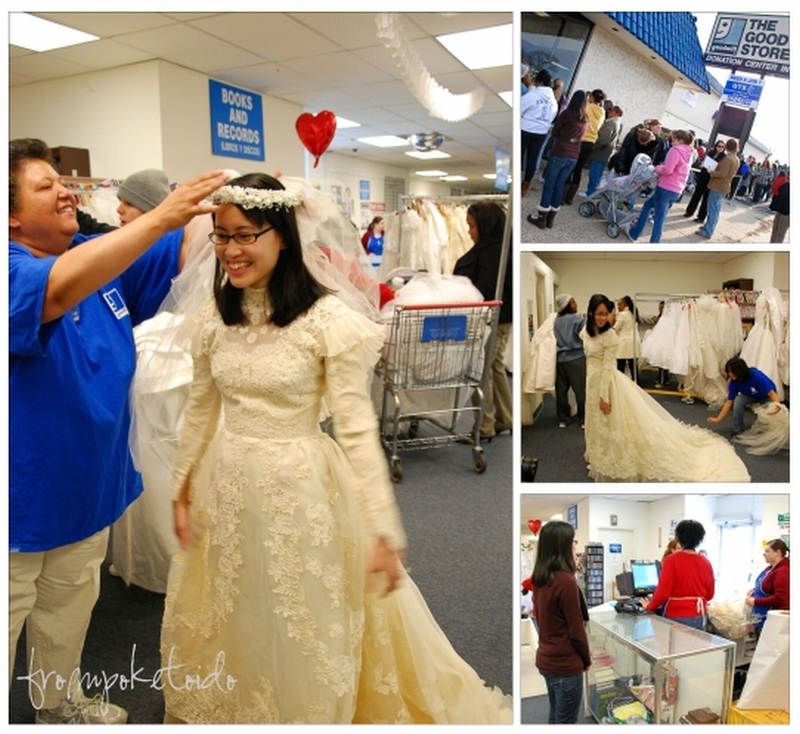 It sure was fun to try it on and act like I was actually planning a wedding. Hehe. Our main shopping goal was to find Hubby some up to date swim trunks, and I think that's our goal every year we travel to the beach. He's super picky, and I can actually understand why. There is a lot to consider when looking for the perfect pair of swim trunks -- elastic or draw string around the waist, zippered or velcro pockets (or even any pockets at all), length, and match-ability. In the end we stuck with his old navy blue trunks and decided we'll try again next time. Hubby did find some super deals on Haggar No-Iron dress pants at a super low price of $12.99. He usually buys them from Costco for around $20, but he hasn't had much luck there in some time. The Haggar outlet had a great variety of colors, styles, and sizes (29 length is so hard to find normally). Hubby ended up buying three pairs for work. Yay! I had some luck myself at one of my favorite stores, J.Crew. There was an additional 20% off all clearance items, and I found two tops and a bottom for around $30. I don't think I could ever purchase their clothes at the somewhat reduced outlet price when it's not on clearance. It never beats buying them on sale in store. I have found two items already that I purchased for $15 or less on sale in season, and they had them in the outlets for usually more than double what I paid. 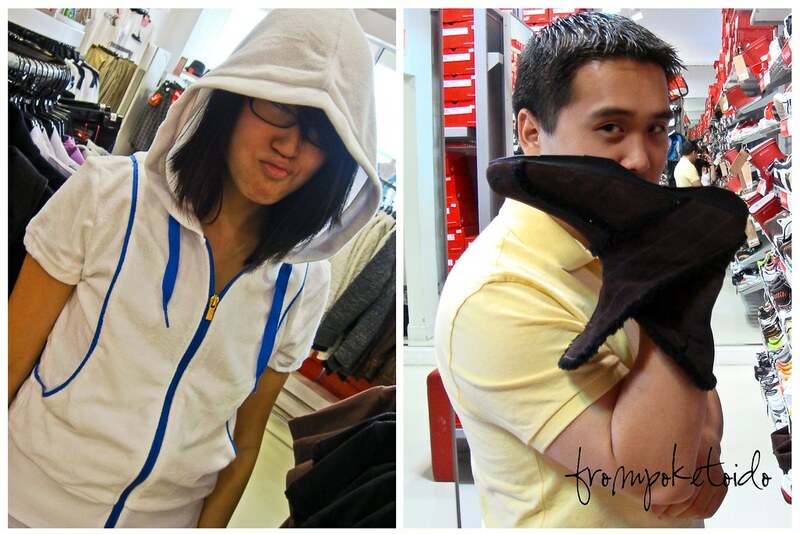 We spent probably a good two hours walking around the outlets to waste time, and boy did we have a great time. It's not often that we get the chance to go outlet shopping, and we try to take advantage of it when we can. The Tanger Outlets actually had some high end new additions, which included Kate Spade (oh how I adore their shoe collection), Michael Kors, Cole Haan (another favorite), Kenneth Cole, and even BCBG. We will definitely be back next year. With another pit stop crossed off of our to do list, it was time to head back on the road again. Will Hubby and Yin ever get to the beach? Stay tuned to find out! 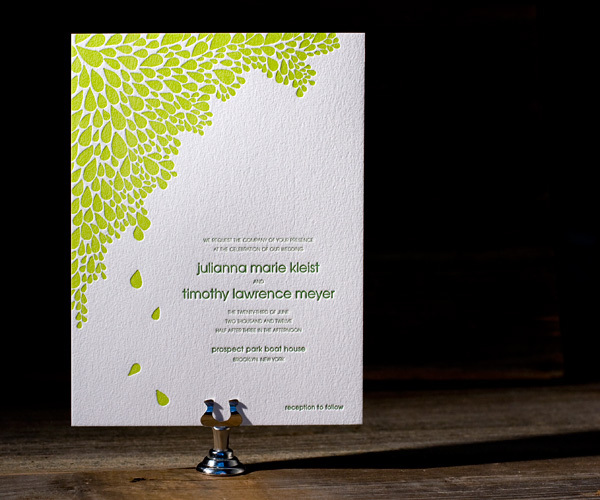 Remember when I blogged about sweet letterpress invites? 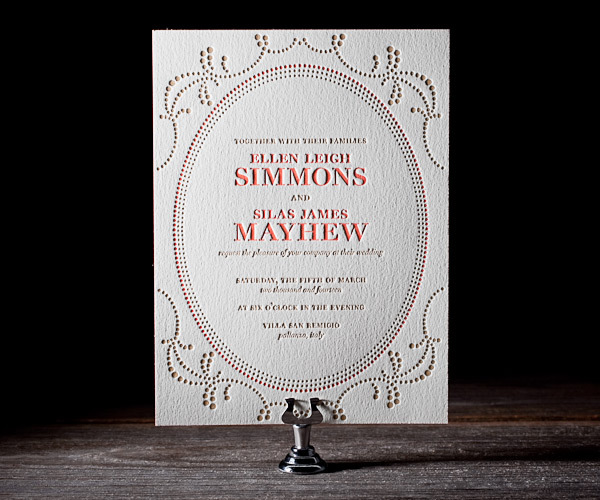 Well you can get your hands on your very own letterpress sample now through August 31st at a reduced price of $1 per sample with free shipping. 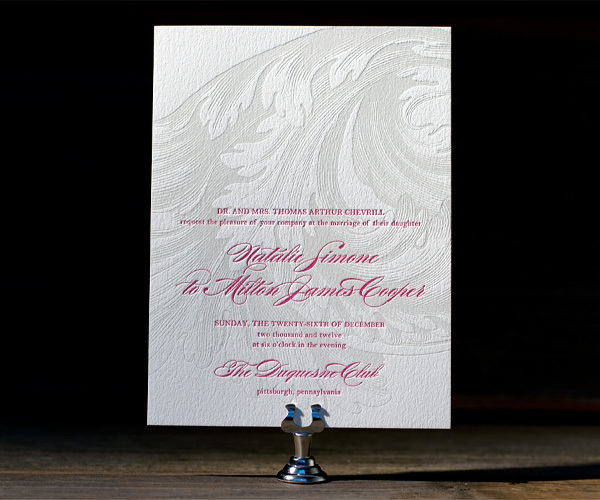 These babies originally retail for $5, and Bella Figura is quality letterpress in my book. 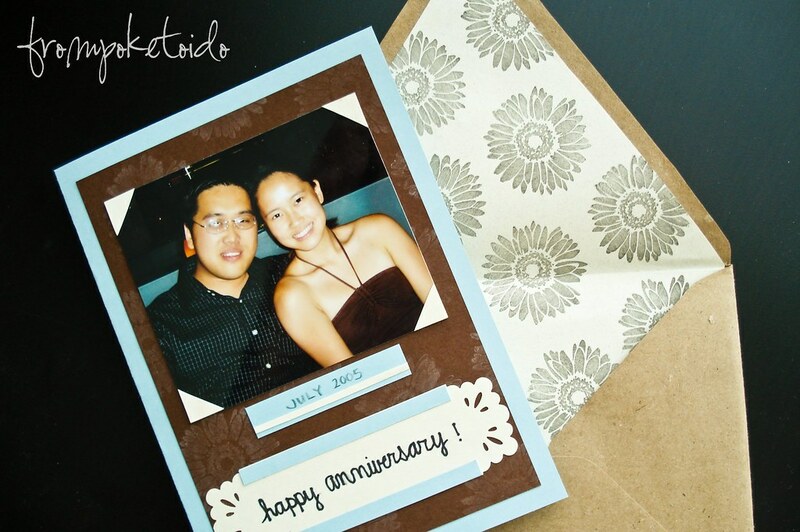 I find myself drooling over their invitations on a weekly basis since Cynthia blogs for Weddingbee Pro. Why is Bella Figura holding a sample sale? It is to benefit the organization American Forests, and all proceeds will be donated to the cause. Isn't that great? 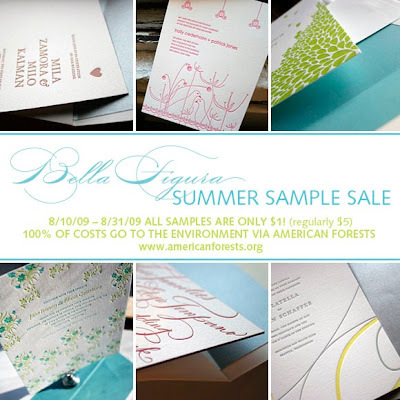 Bella Figura is an eco-friendly letterpress shop, and they use 100% cotton (tree-free) paper. 1% of their sales are donated to environmental causes. Now that's a great company! For the past few weeks I have been consistently blogging. It brings a smile to my face, and I enjoy the process so much. It keeps my spirits lifted, and life is swell when I can blog about it. Sometimes I wonder why I didn't start blogging sooner. Then I remembered why. I just had to take that leap to escape my past and start new. 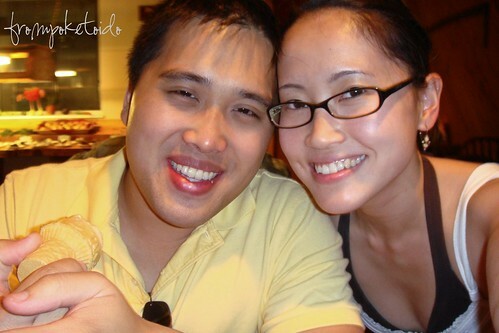 This wedding blog has been in the works since I first started reading Weddingbee back when Hubby popped the question. 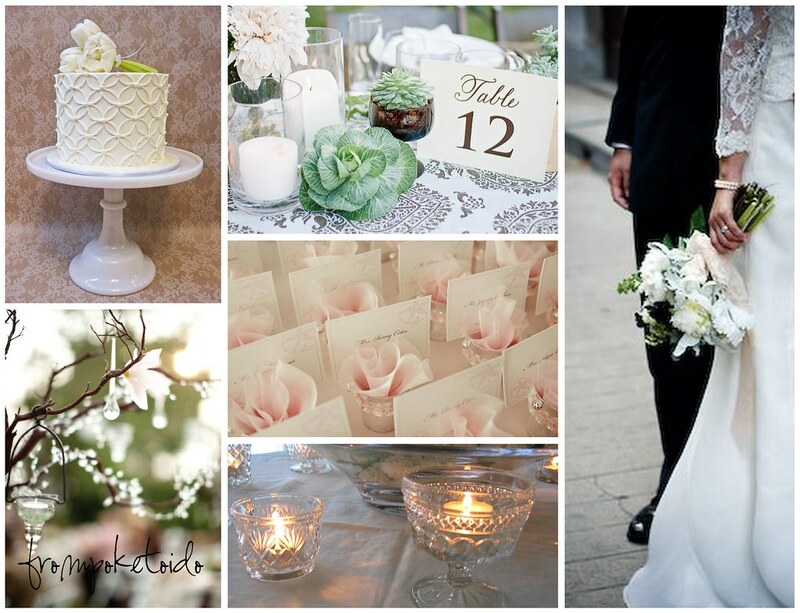 Why not mix my love for blogging and weddings together? While I wanted to start right away, I knew that I couldn't. 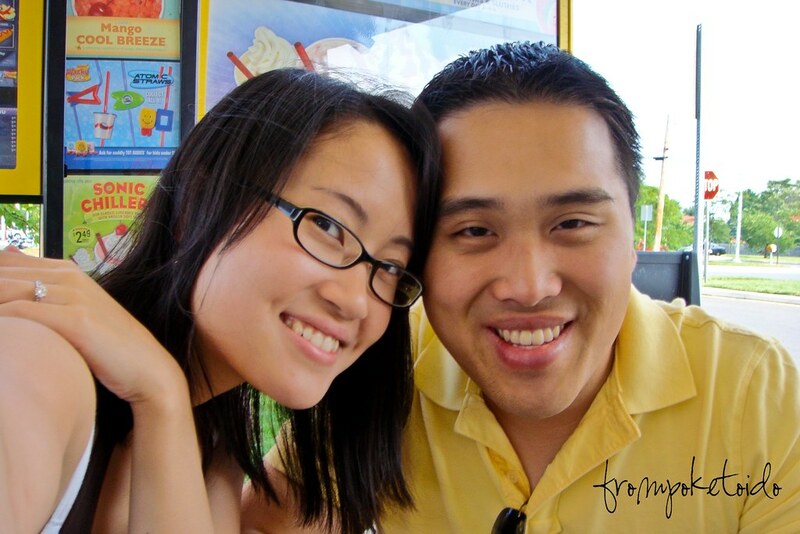 We did not plan to get married until we were financially stable, and a summer 2009 wedding did not sound feasible. We were right. It definitely was not feasible, and now we just have to push it back to summer 2010... or do we have to push it back even further? I'm pessimistic. I don't think it can happen next year, but I know that somehow it has to happen in order to make everyone happy. Then that brings me back to blogging. Sometimes it saddens me to blog about weddings when it's so far away. I was reluctant to blog when I was first engaged because I knew that a wedding would be in the distant future. 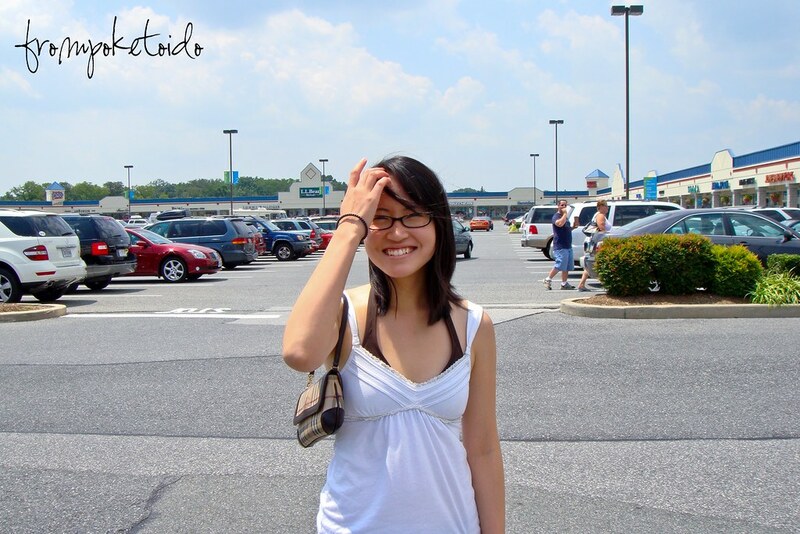 There was no use to blog so quickly with no intention of actual planning, except for in my dreams. 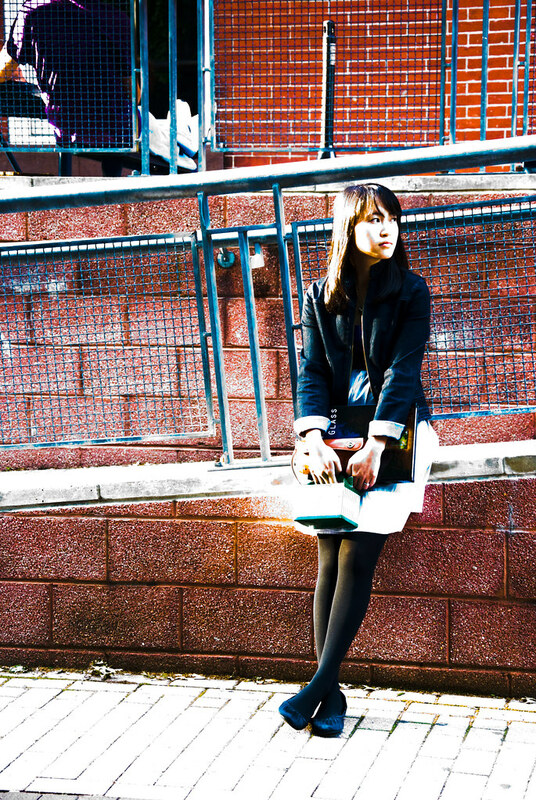 Will I just keep blogging about my dreams and inspirations? I have no real wedding planning experience. I feel like I'm a fake. I wonder if any of my inspiration will eventually come to life? The wedding that is destined to happen isn't my dream wedding. I guess it never was to begin with. 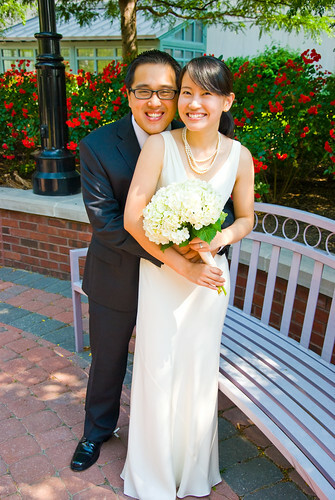 I just accepted it because I knew that there was no way around the traditional Chinese/Viet wedding. I'll get into more details about that later. [Edit] I just checked on Google Reader and happily saw that I have 4 subscribers!! Yay! My combined viewership of 5 people really excites me. Thanks guys for supporting me. You guys rock!! 4 Years & Counting: Off on an Adventure! We woke up at a reasonable time in the morning, even after having such a long tiring evening the night before. Unfortunately there was a lot to be done (packing our beach gear, lunch, & car), and we didn't leave the house until close to 10AM. For us that's pretty much normal, and we went with the flow. We were not the only folks headed towards the beach (you know all of the other hundreds of people who were flocking down there too), and Hubby and I did not want to face too much traffic. I suggested taking 13 down to Middletown to get on Route 1. 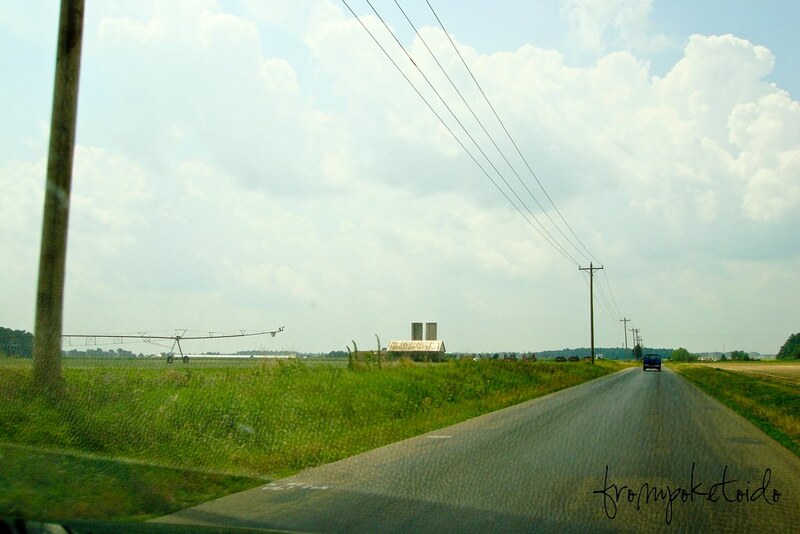 We would save money on tolls and enjoy the open road a bit. It just so happens that there was a lot of traffic at the Middletown exit, and Hubby turned back around to continue on 13. Later we went back on Route 1, didn't like the traffic, and hopped back on 13. We got off just in time for Sonic!! 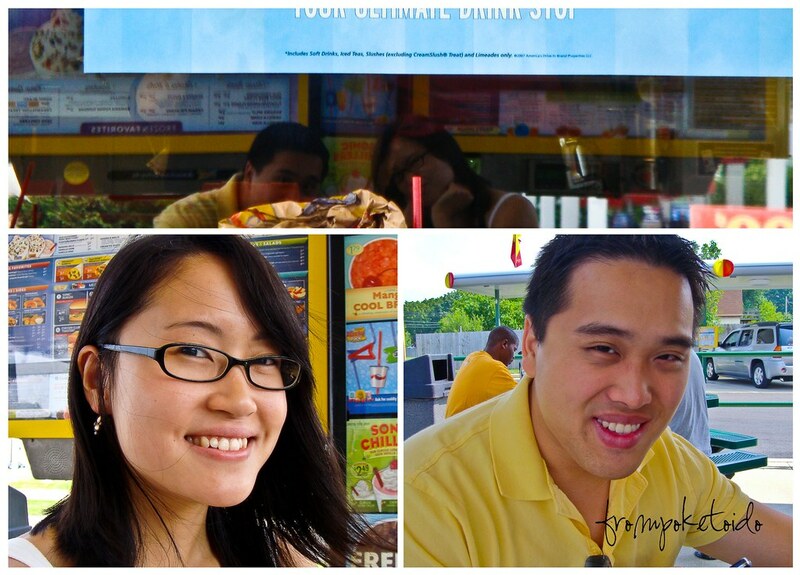 We didn't intend to make the pit stop, but it was now or later.. we chose now. Since they serve their full menu all day long, we didn't have to choose just from the breakfast menu. 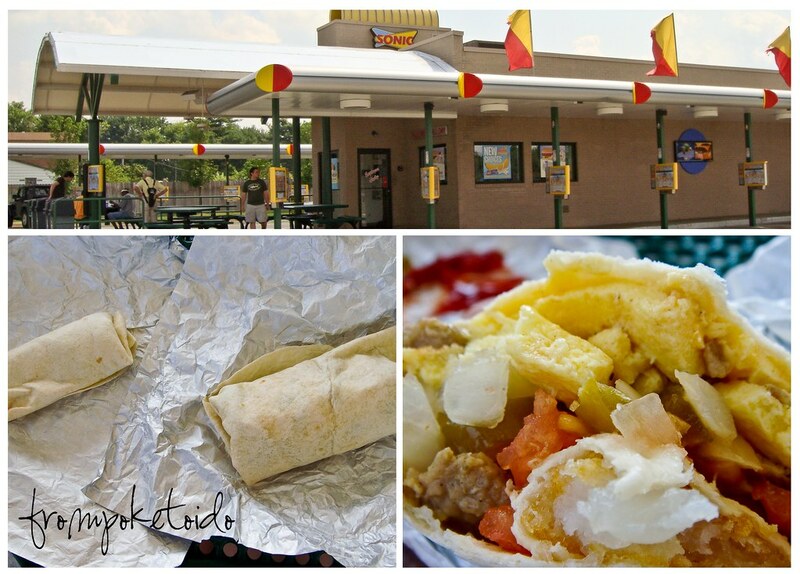 I decided to go with a nice breakfast burrito to start my day, and Hubby chose 3 or 4 items from the dollar menu. You can see the size difference of my burrito next to his $1 burrito in the bottom left. We enjoyed our satisfying lunch break, and before long we were back on the road again. We hit more lights and drove through Dover in broad daylight, which is very unusual for us since Hubby and I prefer late night Sonic runs. Later we joined back with our fellow beach travelers on Route 1. 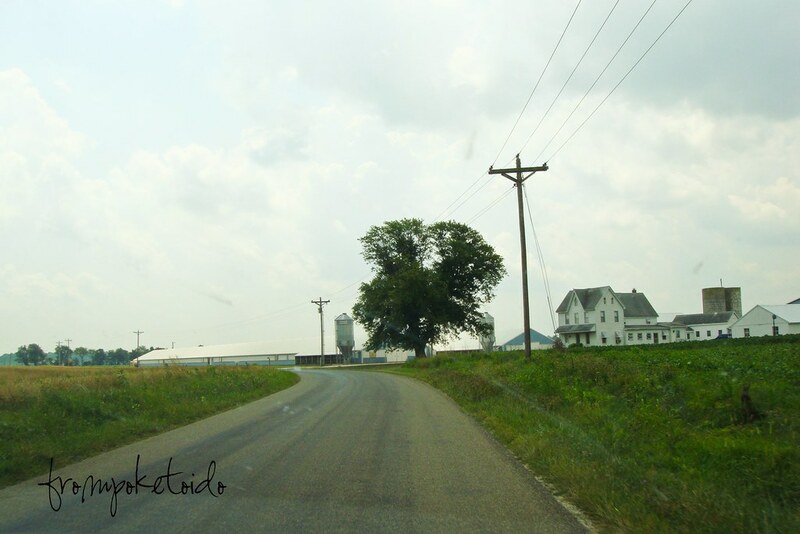 We were surrounded by farmland! It was a welcoming sight, and boy we were glad to be away from civilization for a short while. 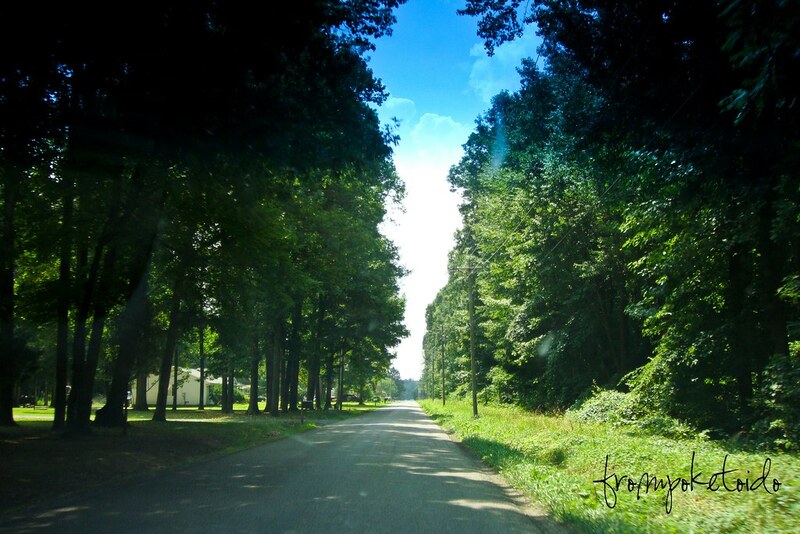 It's amazing how you can get off a busy well traveled road and come across such a beautiful scenery. 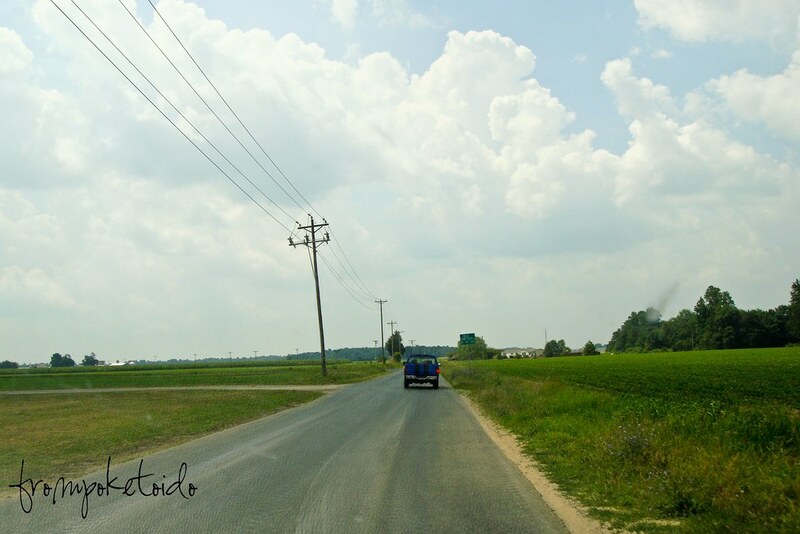 Later we had to face our traffic problems and continue on our trip down south. The nice short cut was definitely too short. I enjoyed the peaceful drive while it lasted. 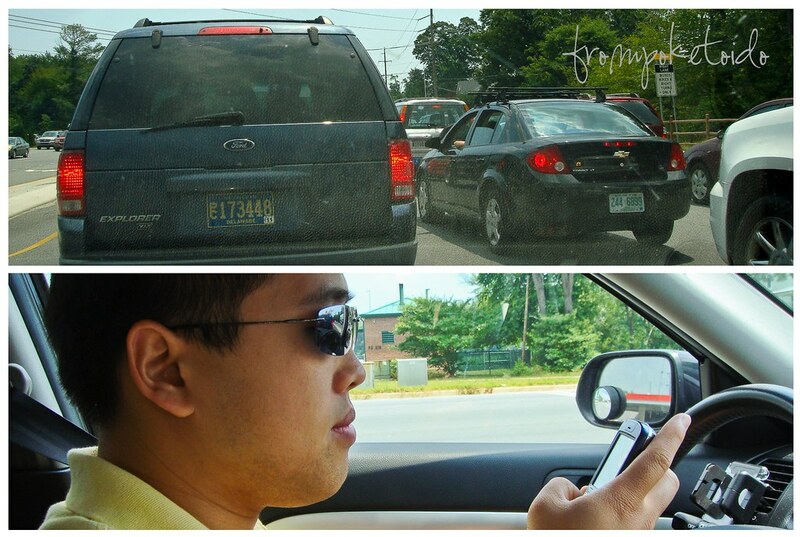 With traffic continuing to build up, will Hubby and Yin struggle to keep sane? Stay tuned for the next chapter of our adventure! 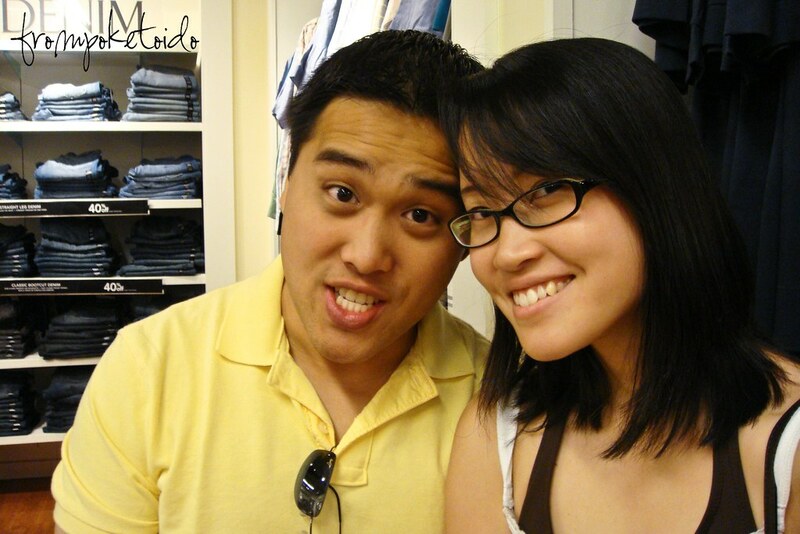 To jump start our anniversary weekend, Hubby and I went to King of Prussia for some relaxing, shopping fun. It was a Friday evening, and it was the perfect way to rewind and end the long week. Yes, Hubby loves to shop with me. I have to be one of the luckiest girls out there to have Hubby as my best friend and shopping buddy too. 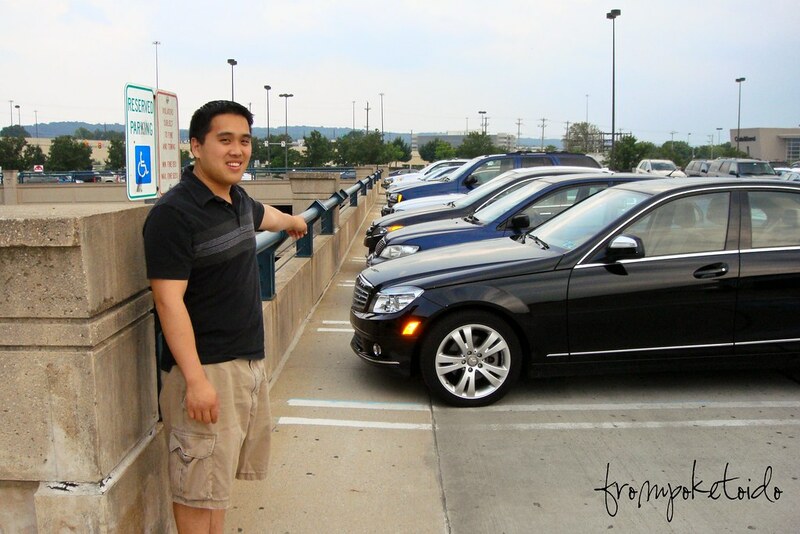 We go to KOP often enough that we even have a preferred parking lot. 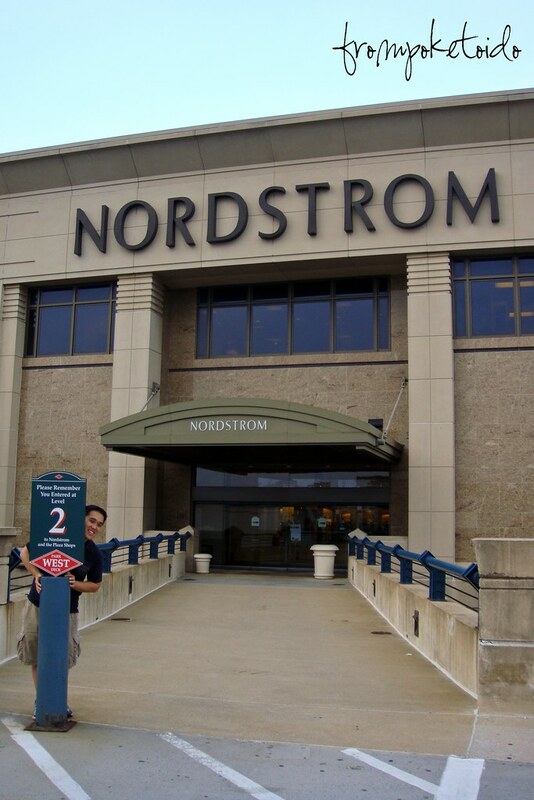 It's a convenient location outside of Nordstroms, and there is almost always parking available. I made Hubby point at our awesome parking spot. I get happy over the small things in life. Aww! He even posed for me in front of our entrance! He then later asked why I was behind the camera instead of him. I need pictures for my blog!! Duh! Hehe. We actually don't shop at Nordstrom. We like to use the entrance to get to all the other stores within the mall, and J.Crew is definitely one of them. Yup, J.Crew is located right outside of the main Nordstrom entrance. Muahahahaha! Shopping was fun and adventurous as usual. Hubby found himself a polo at J.Crew in a lovely shade of yellow. It was on sale with an additional 20% off. Unfortunately I left empty handed, but that's what happens when I drown in their smallest size (it was a dress shirt). I did find some luck at American Eagle. I pretty much hate that store since I worked there for the holiday season one year, but I tend to go back for their jeans. They're the only place that carries jeans that fit my body, both around my waist and length. I left with a pair of jean shorts (my first!) and a pair of bermuda shorts, which I later returned since they were a tad too roomy for me. As usual we spent a lot of time at Urban Outfitters. I thought there was an awesome sale going on, but they didn't have much in store. 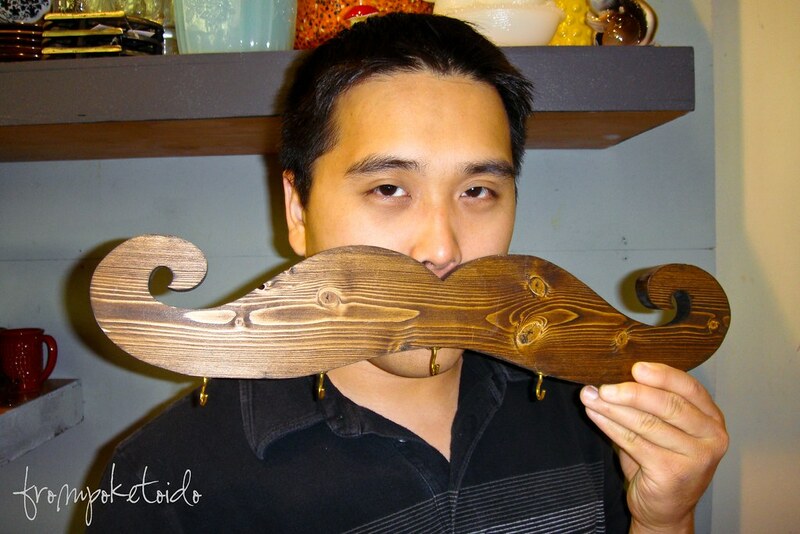 I found this moustache key holder, and I made Hubby pose with it for me. I want him to grow a moustache for me one day for just a few minutes to show me. Apparently he did it once upon my request, but I was too sleepy to comprehend what was happening. 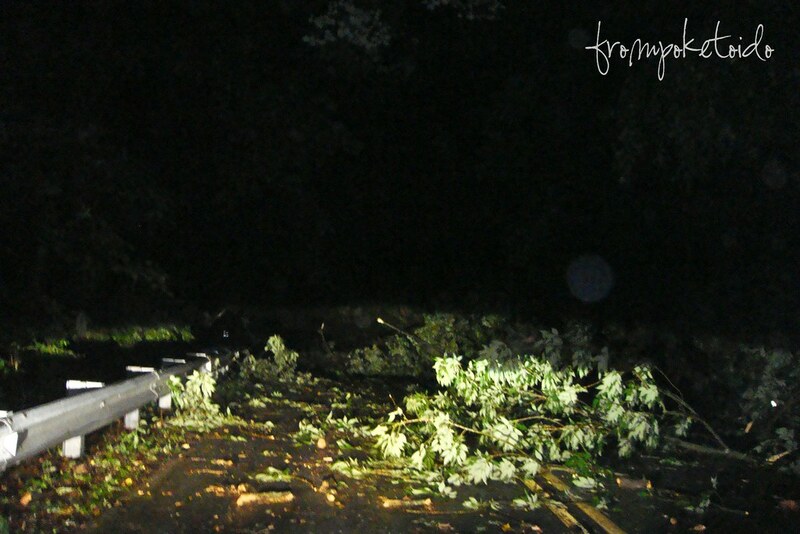 The storm caused some damage to the trees, and the road was blocked. Hubby saw it as a challenge at first, and he actually tried to drive through all the debris. That didn't work out so well. Crazy Hubby! Needless to say this was a tiring evening for the Hubby and Wifey duo. We didn't get home until late, and we didn't get much prepared for the next day. Will Hubby and Wifey wake up in time for the beach? Stay tuned. It was Friday morning, and I just realized how much I had fallen behind. 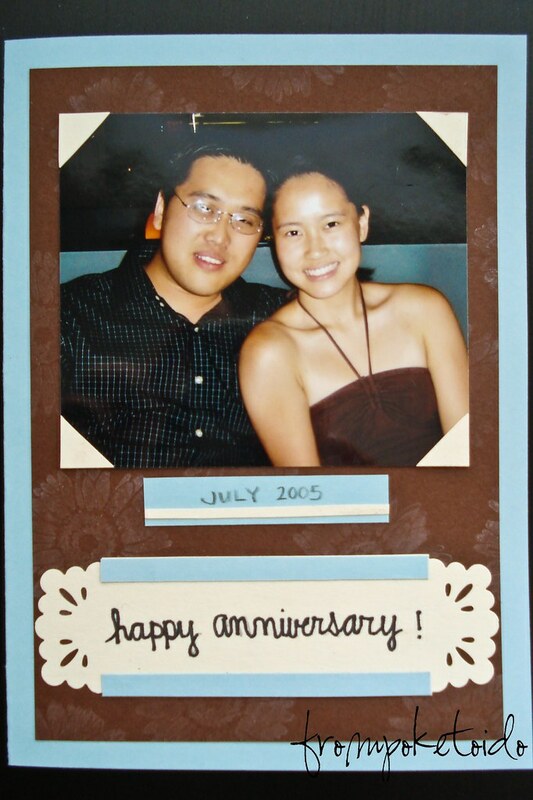 My anniversary was the very next day, and I had yet to make a card for Hubby. Bad Yin. I had very little to no vision, and I just took it one step at a time. That tiny vision only consisted of incorporating a photo of us, possibly from the year we first met. Luckily I had one laying around, and I tried to work everything around that one photo. 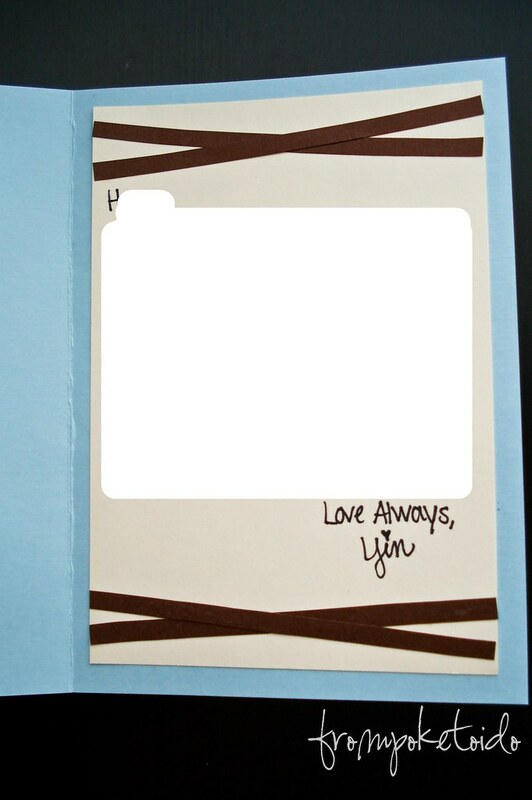 Sometimes I don't always have the perfect piece of scrapbook paper to use as a background for my cards. 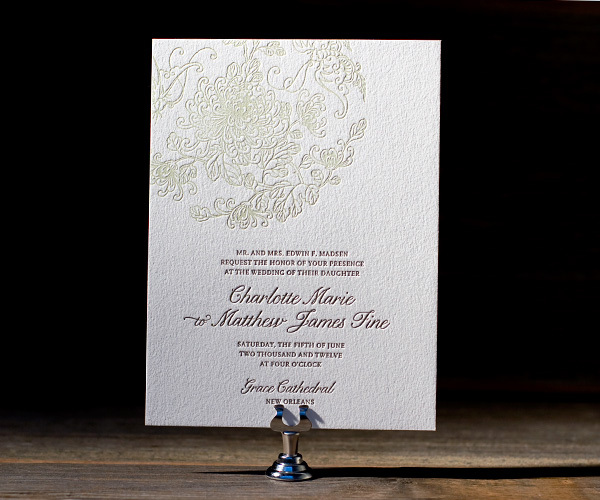 I just use clear stamps to create my own background on card stock to get the perfect look. 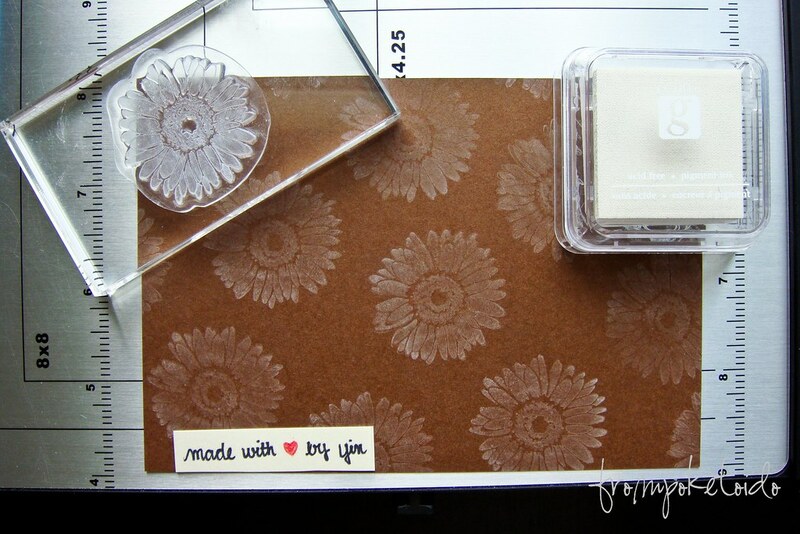 In this case I used a flower stamp using white ink on brown card stock. 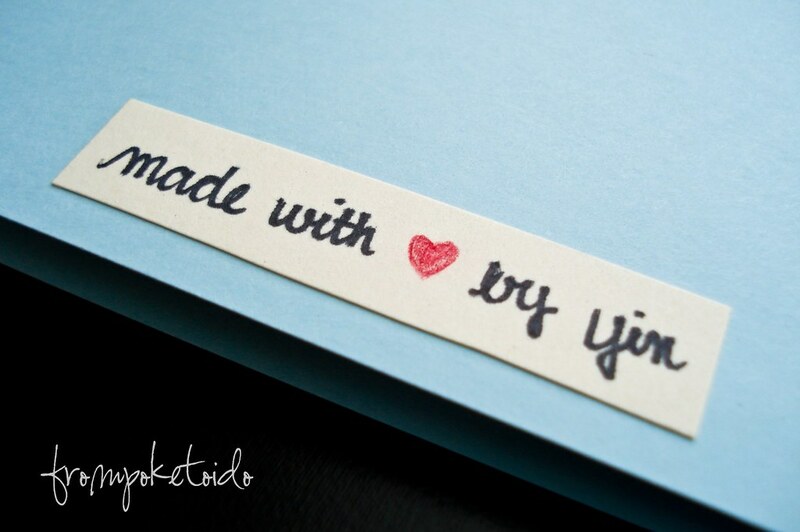 To get the designed paper look, I made sure to sure to stamp on the edges too. This card took me hours to complete, but it sure was satisfying to see the end result. Hubby was super happy with his card, and I enjoyed getting back into craft mode. Life is swell. I love how pictures can easily tell a story just by its presence. 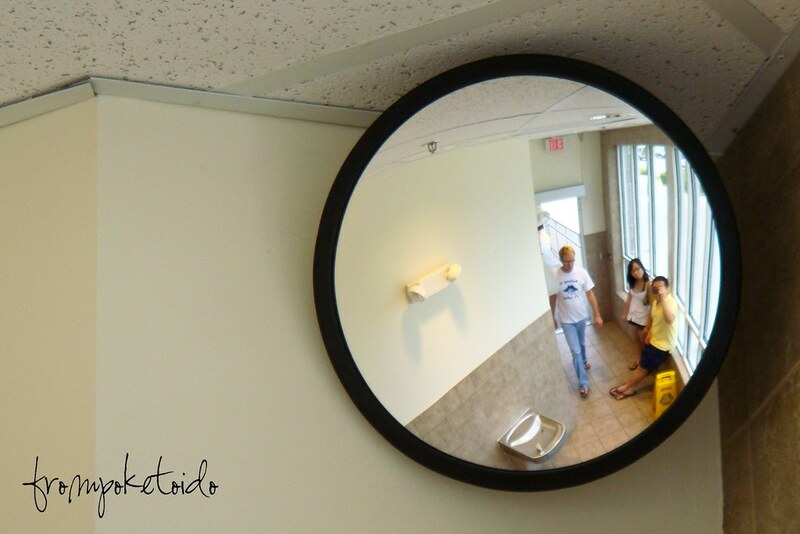 I have always been the type of blogger who tries to include a picture in every entry possible. Instead of just words, there is a visual effect to play out the story. I prefer using my own images because it plays with my own experiences and makes my blog more personal. In the beginning I would just upload my pictures without any worries. Now that I am an avid blogger (now both reading and writing), I have noticed that more popular blogs fall victim to their material being stolen. Sometimes it's straight up a copy and paste sleezy job where they take all of the credit. I have found that food bloggers are often victim to this. Wandering Chopsticks was one of the first who introduced me to this subject, and she had to take measures by adding watermarks to her photos. She writes more about this in her guide to blogging. It made me more aware of the problem, and I knew that it would be something I would have to start doing in the near future. While my blogs do not create much traffic, I do want to cover all of the bases of "what if's." With pictures usually being the first to be "stolen," I looked into adding watermarks for my photos. At first I thought it would be difficult without the use of Photoshop or some sort of special photo manipulation software. 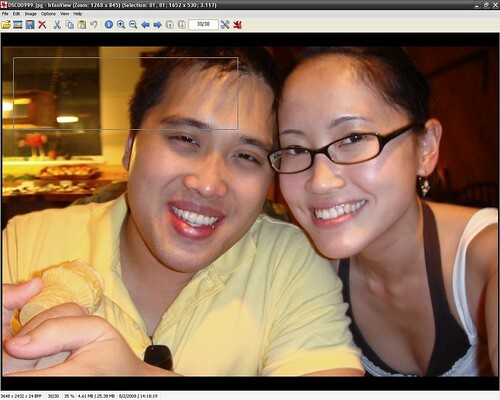 I played around with Irfanview, the program we use to view our photos on the computer, and I found a solution to my problem. It was easy, and now I'm practically a pro at inserting watermarks. By using this method, I am limited by the creativity of the watermark but I don't mind. My photos are no where near professional and artistic. A simple watermark is all I need. 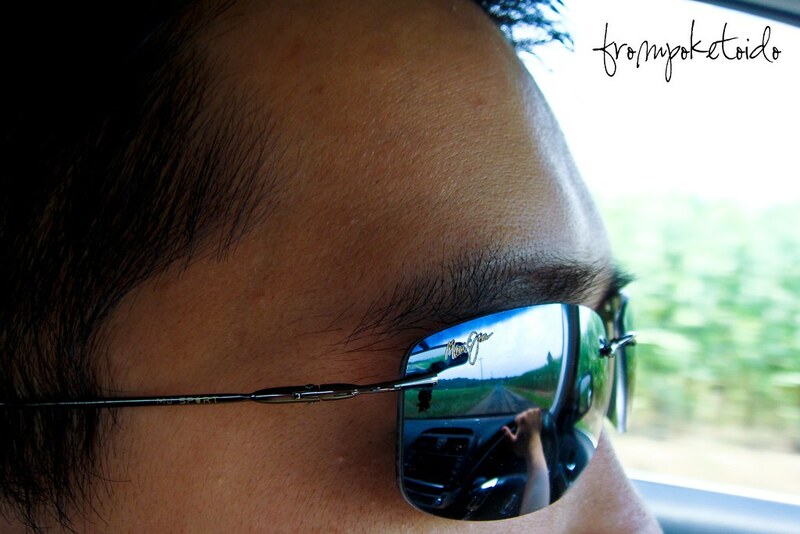 Download Irfanview here. Don't worry. It's free and Yin approved! Open up a photo in Irfanview. Using your mouse, click on the part of the photo you would like to be watermarked and drag to create a box. Next click on "edit" and select "insert text into selection" or simply use the nifty shortcut of [ctrl] + [t]. Type the text into the text box. Click on "choose font" on the bottom right to get to the font selection. Be creative and use a fun font. Also change the size and color to fit your photo. Click "ok," and you're all done! Don't forget to save your work! I recommend saving it as a new photo so that you still have the original copy with no watermark. Simple enough, right? Do make sure that it's everything you want it to be. Don't be afraid to click "undo" multiple times to perform some trial and error to figure out the perfect font, color, size, and alignment. While it is time consuming, it is definitely worth it. Go ahead and give it a try! sneak peak of anniversary recap!